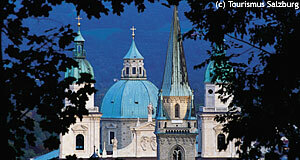 The Dommuseum is located in the richly decorated "Emporenräume" in the Salzburger Dom cathedral. The Baroque splendour of these rooms and the stunning views over the old town and the cathedral are unique, but the main reason to contribute the museum a visit is the artwork that spans 1300 years of sculpture, painting, goldsmith works by many local and internationally known craftsmen and artists. Baroque paintings of Salzburg by Georg Raphael Donner, Johann Michael Rottmayr and Paul Troger are part of the collection as much as older, Gothic goldsmith works. The oldest and most famous part of the Salzburger Dommuseum collection is the "Rupertuskreuz", the "St. Rupert Cross" dating back to the 8th century. A genuine insight into the Prince Archbishops′ obsession with precious objects is provided by the old "Kunst- und Wunderkammer", the "Art and Miracle Chamber". Here you will find a collection of natural items, fossils, gems and ivory carvings - whatever expensive object one of the many Prince Archbishops considered worth being collected.